Have you ever gone a whole day without food? ...Two days? Sadly, many children are going an entire weekend with little or no food when a school meal is not available. One child reported that on Friday he tried to eat as much of his friends’ leftovers at lunch as he could hold because he didn’t know if he would eat again until Monday morning. Another, ate paper to keep the hunger pains away. Children who are suffering from food insufficiency do not perform well academically, display unacceptable behavior, and have poor attendance due to illness or unexcused absences. 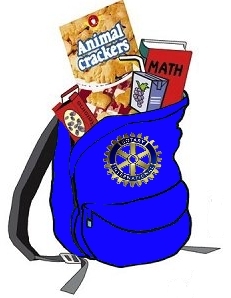 Fortunately, Morris Rotary launched the BackPack Program locally to help alleviate childhood hunger. Nutritious, easy-to-prepare foods are sent home in their backpacks on Friday afternoons to ensure that children have something to eat until they return to school on Monday morning. The difference in academics, school attendance, behavior, and health between a well-nourished child and a hungry child is profound. Boca Raton Elementary in Florida reported an astounding 80 percent overall increase in Scholastic Reading Inventory (SRI), a reading comprehension test by students participating in a Backpack program. Likewise, they reported a respective 31 percent and 29 percent increase in reading and math scores on their SSS diagnostic test given to third, fourth, and fifth graders. These types of increases are not isolated. Backpack programs are making a measurable difference around the country in all the participating schools.